Wide-ranging is probably an understatement for the subjects covered by this Book Sale category. Histories are among the earliest printed works produced apart from Bibles (which are also included). Literature runs, of course, from the earliest compositions from the 17th century right up to modern first editions, with biography being a constant theme running through the centuries. 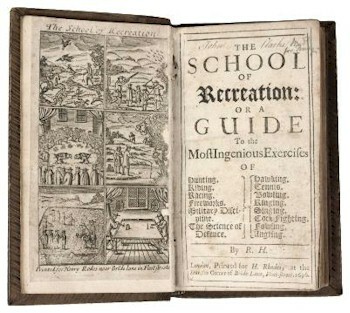 Robert Howlett's The School of Recreation printed for H Rhodes in 1696 realised £450 in our Antiquarian Book Auction in February 2013. Histories of the world are a fascinating study, not only for the information they provide about their chosen subject, but also for their insight into the attitudes revealed by the authors and the view they give of the time they are written. The earliest works recording the history of ancient civilizations, including the Romans and Greeks, are bread and butter to the classical scholars of today. The works of Hollinshed, which were the source materials for many of Shakespeare's plays, are highly sought-after but more modern historians' work, from Ralegh through Hume to the present day also have their devotees. 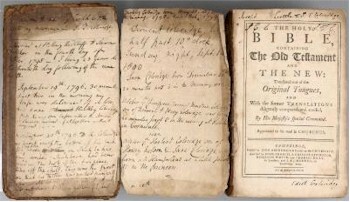 The family bible belonging to Samuel Taylor Coleridge with geneaological manuscript notes, some in the hand of Samuel Taylor Coleridge himself, fetched £5,500 in the Februry 2013 Antiquarian Book Auction. The Bible was, of course, the first book ever printed and although you are unlikely to pick up a Gutenberg Bible easily, many late 16th and 17th century versions appear regularly on the market and are very much sought-after. Robert Barker, who was the printer of the King James Bible, is an important name in this field but look out for the 'wicked' Bible he produced in 1631, where the word 'not' was left out of 'Thou shalt not commit adultery'. Apparently, very few copies of this edition survived and Barker was thereafter disgraced! English literature, from the earliest novels of Smollett and his ilk via Jane Austen and Thackeray to Agatha Christie, is of course a rich area of collecting. As with most subjects, the earliest editions are considered to be closest to the author's original intentions and, therefore, the most desirable. The presence or absence of a dust jacket on more modern works can make an extraordinary difference to value, as these cover were originally intended to be discarded and generally were. 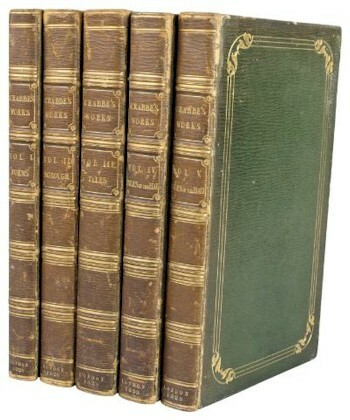 The Works (5 volumes) by George Crabbe with portrait frontispiece and thirty steel, engraved plates by Westall realised £150 at auction. Charles Dickens is a fascinating area of study all by himself and the different 'states' of his works, right from their original publication in parts to later editions 'in book form', were altered by him as he grew disenchanted with a particular artist or illustration or the publisher's advertisements within the works changed. Private Presses became very prevalent, especially in the United Kingdom during the early part of the 20th century. The Nonesuch Press, Shakespeare Head Press, Golden Cockerel Press, etc, aimed to produce books which harked back to simpler artisan method of production using hand presses, handmade paper and issuing limited editions. These books are really works of art in themselves, before you consider the contents, and artists such as Eric Gill were pleased to provide illustrations for them. This idea of producing quality publications was followed up by The Limited Editions Club and The Folio Society who production values were a cut above the average but were (and are) available to a wider audience. Thus, there are works in this field suitable to all budgets. Biographies give fascinating insights into the characters of their subjects and the time in which they lived. Boswell's Life of Samuel Johnson is a particular classic, but there are few individuals in history who have not been written about and as many who have written about themselves.